On Friday, Kevin Drum put out a post Our Coming Mega-Drought, which briefly commented on a recent scientific review by Aiguo Dai, Drought Under Global Warming: A review. The paper really caught my attention and I read it several times this weekend, as well as reading various references and background materials. This post, as well as a follow-on tomorrow, summarizes my understanding at this point, as well as raising a few issues that I don't understand. I make my standard disclaimer: I am not a climate scientist and may get a few things wrong. Given my alarm level after reading this, I will probably do a bunch more research on the issues in coming days and weeks and develop a better understanding. You can see that the upper midwest and plains states are pretty wet with values of +2 to +4 or above, and the south east is in rather a drought with a lot of values below -2. It's important to notice that the PDSI is an index relative to normal conditions. It's not the case that Louisiana is drier than Arizona right now, for example, but Louisiana is drier relative to normal Louisiana conditions than Arizona is relative to normal Arizona conditions. An extreme drought has taken hold in parts of nine states stretching from the Southeast to the lower Midwest, damaging crops, driving up the cost of keeping livestock and putting officials on alert for wildfires. Climatologists say the dry weather likely will continue at least until spring, raising the possibility of prolonged drought in some areas next summer. 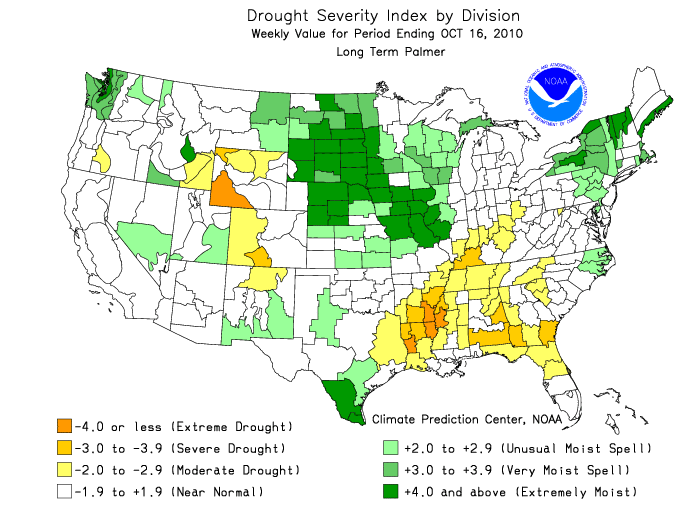 "Six months from now, we could be in a fairly significant drought situation throughout the Southeast," said Brian Fuchs, a climatologist at the National Drought Mitigation Center, a federally funded center at the University of Nebraska that monitors drought conditions across the U.S. "The general pattern is going to show worsening." Parts of Alabama, Louisiana, Arkansas, Mississippi, Tennessee, Missouri, Kentucky, Florida and southern Indiana are suffering "extreme drought," according to data expected to be released by the center Thursday. That means the areas are experiencing the worst prolonged shortage of rain expected in a 25-year period. Montgomery, Ala., has seen just half an inch of rain so far this month. In Memphis, Tenn., the total is 0.01 inch. Northeast of Memphis in Mason, Tenn., Marvene Twisdale and her husband have enough hay and water for now to feed their 10 cows. But several ponds have dried up on the farm. Ms. Twisdale, 67 years old, said the drought was the worst she has seen in 47 years there. "I go outside every day, water my flowers and pray over them," she said. "We are waiting for rain to come." So that's how a PDSI of -2 to -4 will get written up in the WSJ. This caused almost total crop failures, people dying left and right, and large scale human flight from the worst affected areas. So -4 is really bad, and -6 is pretty much old-testament-biblical. So, now that we have a bit of a feel for the scale of PDSI, let's turn to the Dai paper. Firstly, a quick sanity check on the author reveals a twenty year history of widely cited climate papers, including a number specifically on precipitation, drought, and the PDSI, including developing a global dataset for PDSI from 1900 on. He works as a scientist at the National Center for Atmospheric Research. So an expert in this field, and not a crank. This is PDSI's of -3 or worse across much of the world's populated regions. Things are very bad in the US, South America, China, and Australia, and positively biblical around the Mediterranean. This is 2030-2039. This is not your grandkid's world, or even your kid's world for a lot of us: if you are under 50 you will likely live to see these years. We are not talking 5% tail risks here. This is the "ensemble mean" - the average prediction of climate models. So now it's extra-biblical across most of the populated world. The US, most of Europe, China, Australia are all in permanent dustbowl conditions. Needless to say, by the 2090 panel (grandkid's world), it's even worse. Basically, if these projections are correct, this is We're All Gonna Die territory. Global food production under these circumstances is going to go in the tank, and there's no way we'll be feeding nine or ten billion people. So, can this possibly be right? I don't know, but I'll take up some of the considerations in a post tomorrow. Ice ages are cold and dry. Interglacials are warm and wet. If it's warm/hot it's going to be wet. And indeed we've seen flooding on every continent over the last couple of years. I'm certainly not going to believe computer models full of fudge factors when they go against common sense. However I don't have to think for myself :-). John Baez is looking into all relevant scientific issues in the Azimuth wiki and blog: http://www.azimuthproject.org/. You could probably help out if you wanted to. RKS - indeed, the most obvious analogy might be the Pliocene climate, which is generally thought to have been wetter than today. So one possible response is to argue that the climatologists are all fools and the models are all wrong. I certainly won't be quick to be so dismissive without knowing a great deal more about the issues in detail. Another speculation that I am exploring to reconcile what the models seem to be saying with paleo evidence is the idea that the key driver here is the ocean being very out of equilibrium during the 21st century. In other words, because it's warmer, the atmosphere wants to hold more water. However, the ocean is not yet warmed up in equilibrium with the CO2 in the atmosphere. Thus it's not providing enough water vapor, and therefore more is being sucked out of the land (it's the evapotranspiration that is leading to the droughts, not lack of precipitation). Thus, once the CO2 level stabilizes and the ocean equilibriates, it will be wetter (a la Pliocene) but on the way there, the land will get dried out. (This last out-of-equilibrium idea is strictly my speculation and I have don't know if it's a correct way of looking at it yet). 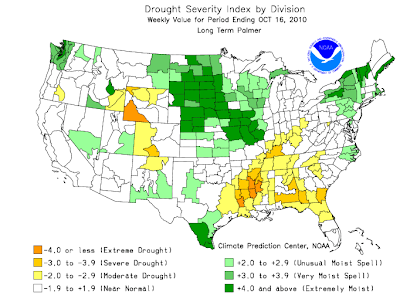 I glanced at your link but didn't see much about drought at a quick scan. I'm a weather forecaster, so I have some experience with modelling. The main problem I have with climate models is that with one or two possible exceptions, they just don't pick up on the 20-30 year natural cycles that we have. I'm not saying that there isn't an upward trend in temps, but the assumption seems to be that the warming we saw in the 70s to early 2000s is going to continue without interruption...which obviously isn't happening. The second issue I have is something akin to expressing statistics using the mean without also telling you the standard deviation. We have no idea how much skill these climate models have in predicting regional climate change. As it is, if you look at medium range models (those that go out 3 months to a year), they often have zero skill over massive portions of the forecast area. This drought prediction is based on IPCC predictions of warming. I had fair confidence in these until I started looking at Rutledge's work on predicted coal & oil production and the resulting impact on future global warming. If you review his projections of future fossil fuel (FF) burning, you see that ALL of the IPCC's FF consumption projections are well above any realistic estimate of remaining FF. If you plug in a more realistic FF consumption rate (which he did), then you see that much of the expected warming has already occurred (due to FF alone) because we are close to halfway through coal & oil stocks. He says nowhere near what the IPCC projects will ever be burned, because it doesn't appear to exist. 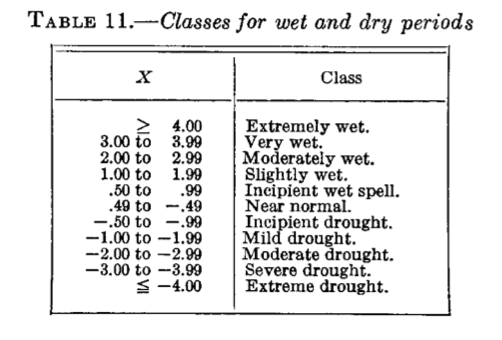 Because the IPCC FF numbers are quite inflated, I suspect that this drought estimate must be similarly overblown. It would be much more interesting to see what comes out of the model with a realistic FF input, such as Rutledge's estimates. I think the whole peak coal thing doesn't make any sense. It's based on very shaky applications of Hubbert theory, and/or assuming that there are huge amounts of coal that will be left in the ground because it's a bit tricky to get out, and ignores that there might be all kinds of innovation or changes in standards if only the price got somewhat higher than the incredibly low values of today. There just isn't any doubt that there are astronomical amounts of coal down there. Eg under the North Sea which dwarfs existing proved reserves. I ought to write more about it, but I just can't summon any enthusiasm for putting time into the subject because it just doesn't seem to me to even be an interesting question. this is "old news" to anyone who has read Mark Lynas's Six Degrees. He talks about this in Chapter One, which covers the likely effects of up to one degree of warming over present-day levels. We have that, and more, baked in already due to past CO2 emissions. So, at least for the 2030-2039 result, David Harlos's objection is irrelevant whatever the ultimately recovered coal. rks's objection is kind of amusing. Don't you think that the climate modellers would also want to disbelieve these results, and go over their models very, very carefully to spot the mistake? As of now, the best hope is that the last generation of models was too coarse (using cells of 172 x 244 or 172 x 96 km) and we'll be saved by weather that happens in the sub-100km size range, and the better representation of mountain ranges possible with a smaller grid. The next generation of climate models will tell. I haven't read the Lynas book, so I can't speak to that, but it's certainly not old news if you rely on the IPCC. Chapter 10 - specifically section 10.3.2.3 - of the WG1 is the relevant thing, and there's nothing remotely as scary as these PDSI maps. Even reading Section 11.3 on Europe and the Mediterranean, you get a dry observation like "The decrease in precipitation together with enhanced evaporation in spring and early summer is very likely to lead to reduced summer soil moisture in the Mediterranean region and parts of central Europe (Douville et al., 2002; Wang, 2005)." but nothing that allows you to assess the scale or the seriousness of the issues compared to past drought, in the way that the PDSI maps do. Is not coal that will be burned in the next 50 years one of two crucial questions? will social disruption from declining oil disrupt coal mining in spite of large reserves. This drought projection could be made from any number of warming scenarios that cover a huge range of possibilities, include some that are likely impossible at the high end because of the enormous (unsupported) coal production numbers used at IPCC (probably only possible if the tundra lets loose, etc.) Before you get too alarmed by the graph, we it might be more interesting to see a high end and low end drought projection corresponding to the IPPC (huge) range for CO2, as well as a projection at even lower levels more in line with Rutledge's numbers (and SS seems to think that DR left out one or more large chunks of coal reserve. "There just isn't any doubt that there are astronomical amounts of coal down there." and would be more realistic than one frightening drought projection with unspecified support as to the included CO2 projection. I bet DR would love to see SS's reserve numbers to revise his analysis. Here's a link on the North Sea - 3000 GT down there, none of it currently counted in proven reserves (itself 800 GT of coal according to BP). Humanity currently emits about 8 ish GT/year of C. So the near term peak coal thing requires making assumptions like no-one will ever figure out how to get any appreciable fraction of that stuff out of the ground, and to me that's a very questionable assumption. Huh. JD posted about undersea coal 5 years ago. Igniting seams and collecting the gas, what could possibly go wrong? Pliocene climate? No thanks. If we had a lick of sense as a civilization we'd run screaming from even the possibility of modifying global temps; people just don't think in terms of even a decade out, generally. Or two business quarters. A century? What's that - is that a quant model for assaying returns on a DJI short? I'm always telling people about what Lovelock said - forget models, aren't these observations good enough evidence? Six Degrees is one of the most depressing books I've ever read. KLR - re "Pliocene Climate? No thanks". We are already out of the quaternary envelope, so it kind of does look like next stop Pliocene. Not much sign of us stopping there either - well on the way to Miocene optimum levels. Oh, I know all that, just prefer to think we can geoengineer our way out a bit, or that the sensitivity will be tampered by sulfates etc. Am especially leaning towards the former since I'm reading Kim Stanley Robinson's book Red Mars, which has mad scientists cooking up all manner of schemes to terraform the place, like tapping monstrous aquifers to fill the Hellas basin. All of which is a bit off the menu for us. In fact KSR depicts an Earth going quite literally to hell, at 10+ billion population. Great book, can't wait to find out what Blue Mars will be like. Near my house are the Red Hills of Dundee, coated with oxidized basalt from the Miocene Columbia River Basalt Group lava floods which likely brought on that optimum. You see these kinds of soils in tropical to sub tropical climes, which gives an idea of how topsy turvy things were then, as the continents were roughly in their modern positions then. Which shows that coal reserves figures are somewhat often even more overblown than oil ones, and the fact that even in the US for instance, miners coal productivity is already decreasing, China is also now importing coal. KLR: Kim Stanley Robinson also has a trilogy on climate change, the first one is called "Forty Signs of Rain". I just finished them all, and I HIGHLY recommend them. Great grasp of all the science involved, great writing. He's very much pro-large-scale interventions (disseminating genetically engineered lichens to capture carbon, salt the seas to restart the Gulf Stream, that kind of thing). I'll get to that trilogy once I'm through this first one! Have enjoyed KSR's writing for quite some time, but am just now tackling these opuses...opii? Sadly, I agree that Peak Coal is wishful thinking. Alaska alone appears to have between 2GT and 5GT of coal, and that's not underwater! Closer to home, the Illinois Basin has 150 billion tons which are being ignored right now because of a relatively small cost differential due to sulfur content. Analysts like the Energy Watch Group take a superficial look at production statistics, and declare that Illinois coal has peaked - that's just....silly. On the one hand, there's a lot of stuff that can and will be burned to generate power, if needed. We often dismiss "oil shale" as a source of oil, but it's an enormous source of easily burned fuel for electrical generation. Unfortunately, we have enormous amounts of burnables, and we won't run out any time soon. We will have to make a conscious choice to leave them in the ground. Fortunately, I think this is both possible and likely. For instance, coal consumption in the US dropped 10%in 2009 ( http://www.eia.doe.gov/cneaf/coal/page/special/tbl1.html ) due to a combination of reduced electrical demand and increased wind and gas generation. But don't forget that coal is much more expensive to transport (in both money and energy terms) than oil or gas, Padzek mentions the coal in Alaska and then saying what it would require to move it (forgot exactly). Otherwise agree that the energy watch group report is questionable on many aspects, but overall still believe that the IPCC scenarios overestimate the CO2 burning rate. The "less burnt" being out of economic reasons and peak oil effect, much more than from "let's keep it in the ground" decisions. But of course doesn't mean that GW isn't also a very serious matter. Mankind started drought about 5,000 years ago. For a chronology of this man-made disaster up to the middle of the twentieth century, see the out-of-print book, Topsoil And Civilization. Since the 1950s, man's destruction-of-topsoil disaster has been supplanted by man's consumption-of-fossil-fuel catastrophe. Along a line roughly from Davenport, Iowa to Saint Louis, Missouri, about 70 inches of rain fell from January through August, 2010; annual rainfall for Iowa is about 34.7 inches, for Illinois about 33.3 inches, and for Missouri about 33.9 inches. See Annual Rainfall for U.S. States. What should be normal? 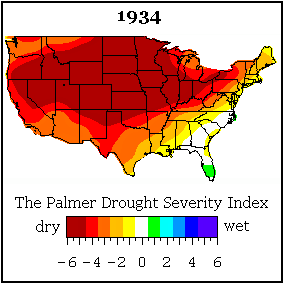 My observations don't prove anything but they do emphasize your statement that the Palmer Drought Severity Index is better at long term predictions than short term.